Most of the copper mining within Wrangell-St. Elias National Park was done by the Kennecott Copper Company (also known as the Alaska Syndicate). 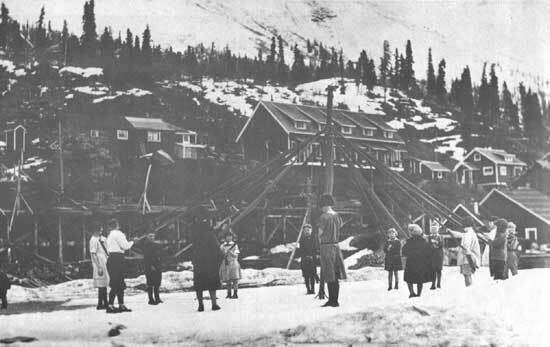 Kennecott's role in Alaska's mining and political history was unique and a matter of considerable controversy from 1905 through 1938. In addition to Kennecott's activity this chapter also reviews copper and other mining in the Kotsina-Kuskulana district, particularly on Elliot Creek, and the North Midas Mine on Berg Creek. Original location of the huge copper deposits in the region was made by a party formed in 1898 by R.F. McClellan. After failing to find anything worthwhile along the Copper River tributaries in '98, the Minnesota men reorganized for another expedition the following year. In late August 1899 E.A. Gates, acting for the McClellan party, and James McCarthy and Arthur H. McNeer, representing other parties, located the Nikolai group of copper mines on the right limit of the Nizina, a branch of the Chitina Fork of the Copper River about 180 miles east of Valdez. Subsequently, the Chittyna Exploration Company was organized, and more exploration was carried on in 1900 which culminated with the discovery of the Bonanza mines some 20 miles from the Nikolai mines. Controversy erupted over the Bonanza discovery because it was not clear whether prospectors Jack Smith, Clarence Warner, and others were acting for the Chittyna Exploration Company or other individuals who eventually formed the Copper River Mining Company. Litigation, started in 1902, resulted a year later in a decision by Judge James Wickersham in favor of McClellan and his partners of the Chittyna Exploration Company. This hard-fought legal battle cleared the way for development. The Alaska Syndicate was formed in 1905 through the efforts of Stephen Birch, a bright, determined young man who from 1900-1902 purchased the fabulously rich Bonanza copper claims with backing from capitalist H.O. Havemeyer. Syndicate parties included the banking houses of the Guggenheim brothers and of J.P. Morgan. The Guggenheims, because of their mining experience, directed development of several mines located on tributaries of the Copper River. In 1908 the enterprise was reorganized as the Kennicott Mines Co., then in 1915 as the Kennecott Copper Corp. with Birch as president. The spelling of the new company's name was unfortunate. Someone, noting the proximity of the Kennicott River and Glacier meant to name the company after those placesbut the spelling went awry. In this study the community is spelled Kennicott, but it has been spelled both ways over the years. Smith and Warner, the Bonanza discoverers, had been searching for the source of the copper float reported by Oscar Rohn of the U.S. Army in 1899. Rohn found rich pieces of chalcocite ore in the glacial moraine on the Kennicott River, so the prospectors moved up the Kennicott to National Creek, where they staked claims. Every great mineral discovery spawns its legend, and the Bonanza was no exception. According to their stories, Smith and Warner were eating lunch when they spotted a large green spot on a mountain across the gulch from them. "A good place for sheep," observed Warner. "Don't look like grass to me," said Smith. Their argument over whether it made sense to climb for a look was resolved when they found of piece of rich looking chalconite on National Creek. A scramble up to the "green field" revealed a sensational discovery. The Guggenheim and Morgan interests realized that they had acquired one of the world's most valuable mineral deposits. They also realized that their holdings were worthless without the construction of an enormously expensive railroad. Engineers examined four different routes for a railroad into the upper Copper River. Two from Valdez would use either the Thompson or Marshall Pass into the Tsaina or Tasnuna tributaries of the Copper, but both involved steep grades. Two more direct routes up the lower Copper started in Cordova or Katalla. The Cordova route did not appeal initially because it entailed the bridging of the Copper River between two active glaciers and laying track over the Baird Glacier's moraine. Katalla's route looked promising, particularly as it, like the Cordova route, would also give access to the Bering River coal fieldsassumed to be a resource wealth of immense potential. Katalla's location on an unprotected ocean shore, however, contrasted with the deepwater harbor advantages of both Valdez and Cordova. The mining business depends on the views of engineers, but this time the syndicate did not get the best advice from its consultants. 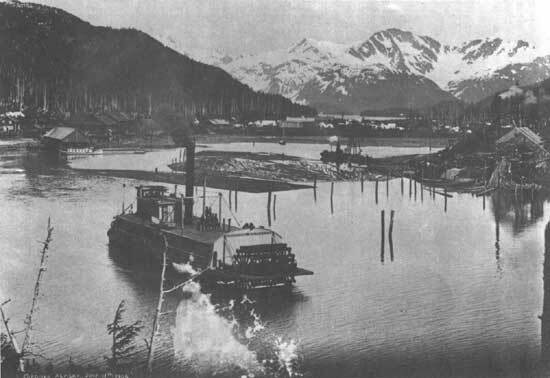 Initially, construction started from Valdez under George Hazelet. Subsequently, company officers concluded that the Copper River route made much more sense and engineer M.K. Rodgers urged a move to Katalla. Rodgers was sure that he could construct a breakwater capable of protecting ships and a wharf to be constructed on the unsheltered coast. At a cost of $1 million the breakwater and wharf were built but a fierce storm in 1907 swept both structures away. The syndicate abandoned Katalla and the proposed route. Michael J. Heney showed better judgment than the syndicate people. Heney, famed for his construction of the White Pass and Yukon Railroad from Skagway, started railroad construction from Orca Inlet (later Cordova) in 1906. Heney expected to sell out to the syndicate when they realized the error of their ways and concluded that his route was the only feasible one. It turned out as Heney anticipated in 1907 after he had pushed the grade work to Alaganik. The syndicate bought out Heney's interest and hired him as grade contractor so he could continue the work. Heney, one of the few Alaska folk heroes, showed his usual drive and organizational genius working for the syndicate but died before the work was completed. The rejection of the Valdez route by the syndicate encouraged the ambitions of promoter Henry D. Reynolds. Reynolds' place in mining history would be notable even without reference to the railroad rivalry. He was a wily operator of mining, transportation, and other commercial ventures whose ethical sense was perhaps overcome by his magnificent visions. Reynolds first appeared on Prince William Sound in 1901, and by 1907 his Reynolds Alaska Development Company was flourishing through mineral production on the sound and Latouche Island. The syndicate's desertion of Valdez as a rail terminal inspired Reynolds to venture into the railroad field. Money flowed in from Valdez residents who believed that their future prosperity would be determined by a railroad. Investors were encouraged by Governor John Brady's enthusiastic support of Reynold's schemes. Brady, an honest, well-respected man, soon rued the day of his association with Reynolds as the apparent conflict of interest caused his dismissal from office. The interior department secretary was aghast that the territory's chief executive would identify himself with commercial promotion. Reynolds raised $200,000 for the Alaska Home Railroad in Valdez and arranged for the hiring of workers in Seattle. He also sought additional funding in Seattle and the Northeast, where he sponsored a weekly newspaper to promote company interests. He was no piker, as the purchase of the Alaska Coast Companya shipping firm, revealed. One thing folks enjoyed about the ebullient promoter was his refusal to be intimidated by the syndicate. In fact, he deliberately antagonized his great rival by sending a ship to Katalla to woo 300 railroad workers away from the syndicate. Before Reynolds' fall, he contributed to an instance of corporate violence that marred the achievement of the Copper River and Northwestern Railway's construction. 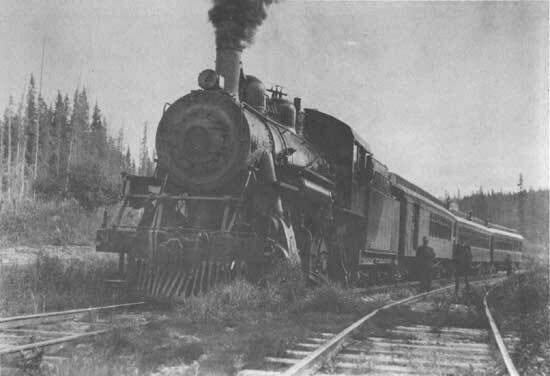 The confrontation in September 1907 between Reynolds' Alaska Home Railroad and the syndicate was perhaps inevitable given the high stakes and the intemperate individuals involved. The Alaska Home Railroad had graded several miles out of Valdez with the enthusiastic support of Valdez folks unwilling to face the death of their hopes for a railroad. On September 25, the Home Railroad men, armed with tools and clubs marched in a menacing manner onto or near the syndicate's grade and Hasey, sheltered behind the rock barricade with a rifle, shot three of them. Fred Rhinehart later died of his wounds. As most Alaskans denounced Hasey's violent behavior, court officers swiftly convened a grand jury. Governor Wilford Hoggatt hurried to Valdez to investigate the affair. His sympathy for the syndicate was obvious but U.S. Attorney Nathan V. Harlan refused the governor's demands for indictments against the Home Railroad men. The grand jury indicted Hasey for murder and assault but, on the advice of Harlan and his deputy prosecutors W.T. Scott and L.V. Ray, they did not indict Hazelet. At the time, they did not have evidence of Hazelet's instruction to Hasey to "protect my rights." As the government's attorneys, John Boyce, William Barnhill, and Scott prepared to try Hasey for murder in Juneau, they were well aware that the attorney general and the president were watching closely. "With an honest jury we can't keep from winning," McAdams assured John Wilkie, chief of the Secret Service. Hasey's defenders, Thomas Lyons of Juneau, John Carson of Tacoma, and Fred Brown and John Ostrander of Valdez, conferred often with Jarvis, Birch, Hazelet, and the syndicate's law firm of Bogle and Spooner in Seattle. Ostrander, the defense team leader, derided Scott and Boyce as "a pair of old grannies," and complained of Judge Royal Gunnison's slow pace. The presence of McAdams, "a bad actor," and "so-called detective" did not awe him: "I think we will be able to show him up." With Hasey in jail and the Alaska Home Railroad bankrupt and disgraced because of questionable activities by its promoter, the syndicate's reputation improved. Construction of the Copper River and Northwestern Railway and other developments captured public attention. Michael J. Heney, "the Irish Prince," was the railroad contractor and a universally admired figure. Heney had built the narrow-gage White Pass & Yukon Railroad from Skagway to Whitehorse during the Klondike gold rush. The new railroad was a greater challenge because of its far greater length, wider gage, and the formidable obstacles posed by huge glaciers. It also answered a long-expressed desire of Alaskans for an "all-American" route to the interior. 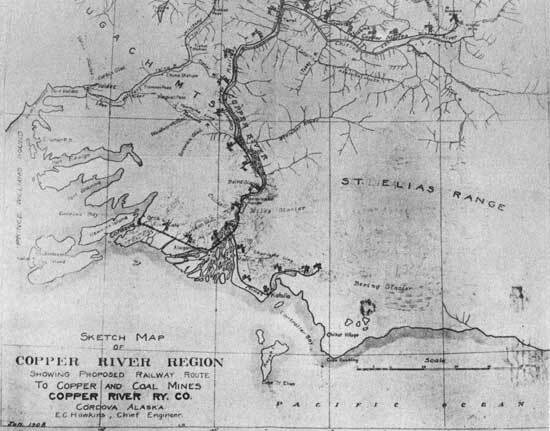 Syndicate officers often declared their intent to carry construction of the railroad all the way to the Yukon River to achieve a combined rail-river route that would aid territorial development. 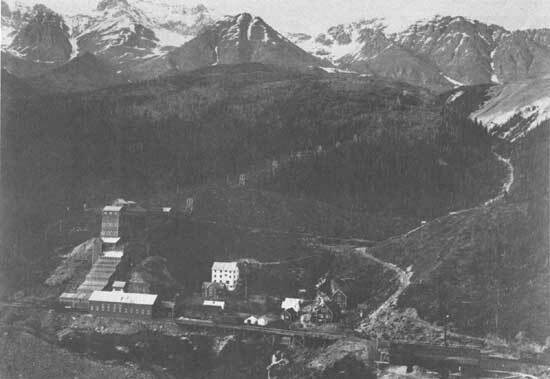 Whether the syndicate was ever genuinely interested in building beyond Kennicott is not clear, but when the line reached the copper mines in 1911, construction ended. Construction plans called for a single-track, standard-gauge railroad running 131 miles to Chitina from Cordova; then branching to extend 65 miles to the Kennecott mill. The route from Cordova was south and east across the outwash from the Sheridan Glacier to Alaganik, a western slough of the Copper River, then northeast to the main channel of the Copper River delta. The first bridge was constructed at mile 27. The line crossed the delta to mile 39, Katalla Junction, then turned north for 10 miles and its main crossing of the Copper at mile 49. Following the right limit of the Copper, it ran through Abercrombie Canyon, across Baird Glacier moraine and the Aken Glacier outwash to the confluence of the Tasnuna and Tickel rivers. Thence, the line entered Clay Wood Canyon and followed the Copper to Chitina. Bridge building, particularly that of the "million dollar bridge" at mile 49, provided the most dramatic highlights over the 1907-1911 construction period. In the summer of 1909 Hawkins and A.C. O'Neil, superintendent of bridge construction, took on the formidable task of bridging the 1,500-foot channel at mile 49 where the Copper flowed between the Miles and Childs glaciers. The project was unique because of the glaciers' impact. Just a mile above the crossing, the 3-mile front of the Miles Glacier discharged a valley of icebergs from early spring through late autumn. The largest of these icy behemoths weighed thousands of tons and coursed downriver with a 12-mile current. Somehow the ice had to be diverted while the bridge was constructed. Once in place the bridge had to be protected from the annual spring river breakup, when ice frozen to depths of 7 feet would be loosed to smash against any structures in its way. At the peak of railroad construction, 6,000 men labored on the project. Excavation totaled 5,180,000 yards, more than half of which was solid rock and embankments placed comprised 1,200,000 yards. Fifteen percent of the 196-mile railroad was built on bridges or trestles with 129 bridges between Cordova and Chitina. Of these bridges five were major steel structures totaling 4,000 feet. Construction cost $23,000,000. Valdez did not fade away because it did not get a railroad but Cordova developed into a substantial town. Cordova's site had been the old Indian village of Eyak and a cannery location before it was designated the railroad terminal. Its natural features include a good harbor, plenty of level ground, and its locationonly 20 miles from the mouth of the Copper River. By 1909, a year after its founding, 1,500 people lived in Cordova, served by 10 stores, two hotels, two lumberyards, three churches, 10 saloons, and a school. Cordova's interests were bound to the railroad and to the syndicate. Even in its raw beginnings, Cordova offered some amenities, including places to eat, drink, and gamble. For those who did not like saloons, there was the clubroom of the Episcopal Church, which was supervised by E.P. Ziegler, later a famed painter. Men could play cards, shoot pool, smoke, drink coffee, and read magazines without any obligation to attend church services. Among the interesting shops in town was the photograph studio of E.A. Hegg. Hegg's photos of the Klondike stampede are among the best-known pictures of that event. After the Klondike rush, Hegg went Outside for a time. Later, he returned for employment as photographer on the construction of the Copper River and Northwest Railway, then ran a studio in Cordova. Cordova, of course, survived the closing of the Kennecott operations and the end of the railroad. Its modern economy depends upon fishing and the burgeoning recreation and tourism industry. McCarthy, 150 miles inland from Cordova, developed into a small community in 1908, serving the railroad and Kennecott mining interests. About 4 miles from Kennicott, its facilities provided some relief for mine and mill workers who preferred recreation away from the company town. The town's peak population in the 1920s was 127. A few of these were prostitutes, who were not allowed at Kennicott. McCarthy survived the closing of the Kennecott operation to exist in a ghostly fashion and even survived the loss of the bridge that linked it to the Edgerton and Richardson highways, but it has been home to few since the 1920s. Chitina, a railroad town 100 miles inland from Cordova on the Copper River, was another small community that gradually died after Kennecott shut down. It functioned as a transfer point for a stageline that connected Chitina with Willow Creek Junction on the Valdez Trail. Quite a few Indian families made their homes at Chitina during the railroad era. According to legend, the visible wealth of the copper lodes developed by Kennecott had been obvious to beholders for years prior to their actual mining. In fact, W.E. Dunkle, a mining engineer employed by Kennecott in the company's early years, found that determining the lode's value was not easy. Company experts made a microscopic study of the Kennecott chalcocitethe main ore bodywhich resulted in a wrong assessment of its value. Their investigation "seemed to show that the copper glance was secondary after bornite." At the time, around 1912, the only mining that had been done on the Bonanza fissure and the rich cliff outcrop ore body of glance pinched out at 300 feet. Little work had been done on the parallel Jumbo fissure, and nothing on the surface indicated the enormous ore bodies that would be found there. With completion of the railroad in 1911, the syndicate's heavy investment finally began to pay off. Mining and milling had been going on for some time, and the loading dock at the mill was full of ore. To reach the main adit level of the Bonanza Mine at 5,600 feet, workers either hiked a 4-mile trail or rode the bucket tramway. Miners much preferred riding the aerial tramway to walking, despite the risk. The Bonanza tram was capable of moving 1,000 tons of ore a day to the mill. Some high-grade ore was shipped out directly, most passed through the mill for concentration. Further processing of mill tailings followed in the beaching plant, which could treat 600 tons a day. Equipment for a 400-ton mill, the tramway, the power plant, and other structures had been transported from Valdez by pack horses and sleds long before the railroad was completed. By that time the first mining tunnels had been driven into the Bonanza and Jumbo mines, and each had its own aerial tramway. The Jumbo tramway, extending 16,000 feet, was the second one built and began operation in 1913. 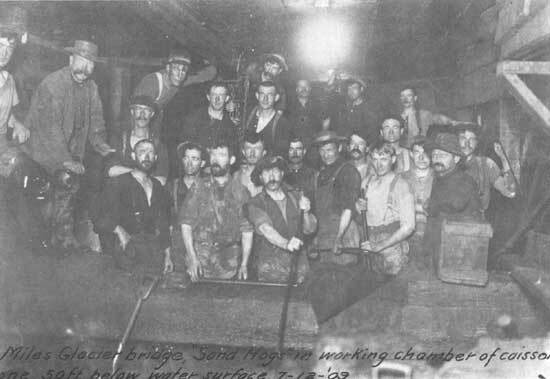 By 1916, with high war prices encouraging production, the mines and mill were operating around the clock with three shifts of workers. Each tramway carried 400 tons of ore each day. Most ore was low grade, averaging 7.5 percent copper, but the Jumbo mine's output of high grade, 70 percent copper, was almost half of its yield. Maintaining year round operation of the railroad, mine, and mill was a formidable responsibility. Heavy snows sometimes taxed the abilities of railroad crews, despite use of the largest rotary snowplows made. Heavy storms hindered mill-mine operation at times, as in spring 1919 when communication between mines and mill was disrupted for several days when slides wiped out telephone lines, demolished tramway towers, and closed trails. Slides at the Mother Lode threatened bunkhouses and forced miners to live in the mine tunnels for several days. The Erie was the fourth mine of the Kennecott group. It perched high in the cliffs above the Kennicott Glacier, 4 miles north of the mill. It was connected to the Jumbo by a 12,000-foot crosscut. Erie's production did not compare in volume with that of the other mines, but it helped maintain production after Jumbo reserves dwindled and served to justify an expansion of the tramway and mill in 1920. Tramway capacity was increased to 600 tons and the mill's to 1,200 tons daily. Production statistics from 1901-1940 summarize the rise, flourishing, and decline of the industry. Note that the following production statistics include output of all Alaska's copper mines. Kennecott and the mines of Prince William Sound (see Chapter 7) contributed 96 percent of the total. Prince William Sound production amounted to 214,000,000 pounds from 1904-1930. The 550 employees in 1924, divided between the mill (249) and the mines (321), earned a monthly total of $86,337. It cost 8.23 cents a pound to process the ore for copper (aside from the gain from the silver extracted from the ore), and reserves were dwindling. Earlier high-grade ore assayed at 75 percent; now the Bonanza-Jumbo ore was 50 percent and that of the Mother Lode about 60 percent. Copper prices averaged 14 cents a pound from 1924-28 and rose to 24 cents in 1929, but Kennecott's limited reserves did not enable the company to take full advantage of the boom. Low prices rather than low grades were the chief factor in the company's decline and end. The company town of Kennicott (Kennecott) was laid out beside the Kennicott Glacier. As was mentioned, the different spellings for the glacier/river and town company is an irritating memorial of careless spelling. 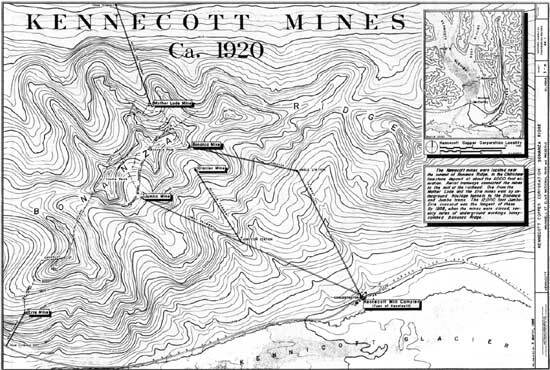 (Modern maps show "Kennicott" as the townsite name, but earlier maps spelled it "Kennecott.") Kennicott was the name given to glacier and the river by U.S. Army explorer Oscar Rohn to commemorate Robert Kennicott, leader of the scientific corps of the Western Union Telegraph Expedition of 1865-67. Located about 4 miles from McCarthy, the town's elevation is 2,200 feet. At its peak in 1920, Kennecott had a population of 500, including the majority of miners who lived in buildings near the mines high above the town and mill. Most of the town's residents enjoyed socializing. Movies were shown on Wednesday and Sunday nights in the town hall. On days like New Years Eve, live music was arranged for dancing. During the summer, baseball was popular, as was fishing. Almost everyone hunted some in the fall. Summer fun also included the year's biggest celebration, Fourth of July, held in McCarthy. The company took advantage of its isolated location to protect against contagious diseases. All new employees were required to spend several days at a camp outside of town to reduce the risk of bringing in disease. Religious services were conducted in the schoolhouse whenever a priest or minister from Cordova appeared. Reading was popular. A lending library supplied the latest fiction, and many residents subscribed to magazines which were handed around. Shopping was easy since most of it was done through the much-studied mail order catalogues of Sears, Roebuck or Montgomery Ward. Foodstuffs, mail, and catalogue orders arrived by train although there were a few vegetable gardens in the summer and the company's dairy supplied butter and milk. Some miners liked working at Kennecott because unlike most mines, it provided work for the full year. Others used their employment to put away a stake to support their own prospecting or mining. Some men spoke well of Kennecott's management, and others did not. The company did seem to provide for workers and their families, medical, recreational, and educational needs, but employees were wise to remember that its policies were dictated by self-interest. No one ever accused the company of outright benevolence to employees, but it met the standards of the day and achieved its corporate goals. Individuals who recorded their impressions of Kennicott all mentioned particular accidents. Some were acts of nature, like winter snow avalanches, but more common were accidents in the mines, the mill, or in the tramway. The Alaska property was operated until the latter part of October when all ore of commercial value was exhausted and the property closed down. Equipment having any net salvage value was removed and shipped out before abandonment of railroad properties. Small lots of high-grade chalcocite ore have been intermittently shipped from the Kennicott area since 1938. 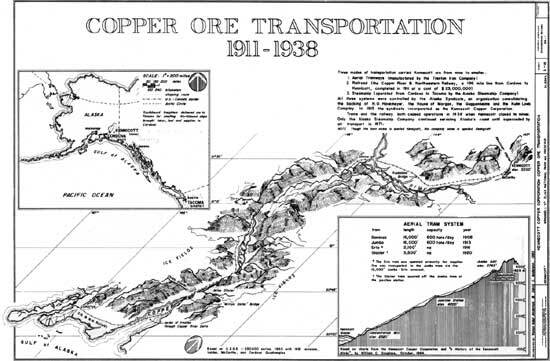 State records indicate that 32 tons of copper ore were shipped from there in 1965. All shipments were flown by DC-3 to Glennallen by a small operator. The impact of Kennecott on Alaska's development cannot be measured by production statistics. Its importance in the territory's economy can not be exaggerated. Kennecott's operation commenced as placer gold production in several regions of Alaska was declining. Its large investments heralded a new era of corporate expansion and provided a much-needed payroll for many years. The Kotsina-Kuskulana district lies in the west end of Chitina Valley on the southwest slope of the Wrangell Mountains. Though small, 16 miles long and 12-1/2 miles wide, it was considered for many years to be rich in potential for copper and possibly gold and silver as well. As it turned out, the region is the best Alaska illustration of disappointment following long-proclaimed expectations of wealth. What kept the focus on the region's potential for so long was its proximity to the Kennecott mines some 20 to 30 miles away and the resemblance of its mineral formations to those of the fabulously rich Kennecott group. 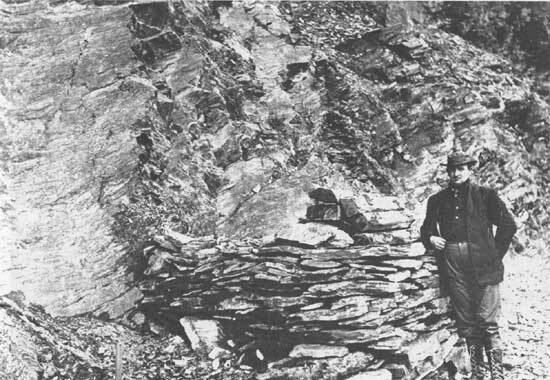 Government investigation of the district began with Oscar Rohn in 1899, followed by USGS surveys in 1900, 1902, 1907, 1912, 1916, 1919, and others. Traversing the mountainous terrain was difficult and treacherous. The valley floors of the Kotsina and Kuskulana are at 2,000 to 2,500 feet, and surrounding peaks rise from 5,000 to 7,395 feet. Most of the valleys tributary to the Kotsina and Kuskulana are hanging valleys, so-called because their mouths are above the level of the main valley floors and can be entered only after a steep climb of several hundred or a thousand feet. Access to the district remained difficult even after the construction of the Copper River and Northwest Railway. Even in the 1920s prospectors still sledded in their provisions over the winter. Mail and small items could be brought in from Strelna over summer trails via Rock and Strelna creeks or by Roaring and Nugget creeks. Miners called for a wagon road down the Kotsina River to Chitina or some other point on the railroad but did not get it. Most of the claims still active in 1922, when Fred H. Moffit and J.B. Mertie, Jr. of USGS investigated the district, were on tributaries some distance from the Kotsina. Among these were the Cave, Peacock, Mountain Sheep, and Blue Bird claims on Copper Creek. Others on Amy, Rock, Lime, Roaring, and Peacock creeks, the Sunrise Creek group and the Silver Star group (considered valuable for silver rather than copper) were owned by Neil and Thomas Fennesend. Prospects on Berg Creek, a tributary of the Kuskulana River 12 miles from Strelna, were staked by the North Midas Copper Company in 1916. Earlier claims on the ground had expired for want of recent assessment work. The Midas company went to work on tunnels and was soon mining ore from two levels reached by separate adits. In winter 1918 a carload of gold ore was shipped out, and that summer a mill, crusher, and cyanide plant were installed. A Roebling cable tram 4,600 feet long and capable of carrying 5 tons an hour connected the mine to the mill. Production in 1919 was only 40 ounces of gold and 513 ounces of silver. The mill was shut down in 1925. Radovan came to Alaska to work on the Copper River and Northwestern Railroad and later mined placers on Dan Creek and lode on Glacier Creek. His greatest feat was in staking a group of claims on Binocular Prospect near Glacier Creek. The existence of a large copper stain high on the face of a steep-walled recess in the mountains, had intrigued prospectors for years. No one had been able to reach the stain, but many scanned it with binocularshence the name. After several unsuccessful attempts to reach the remote face, the Kennecott Copper Corporation got serious about it in 1929. It hired several expert mountain climbers, but they called it quits without succeeding after a summer's effort. Meanwhile, Radovan climbed to a gulch just north of Binocular Prospect and put in a hazardous week cutting steps hundreds of feet along the face of the cliff until he reached a point 200 feet below the Binocular stain. From this point he scaled the wall using ropes and drill steel driven into rock crevices. Radovan staked claims and did some work before giving up working the difficult site. Geneva Pacific purchased the claims from Radovan before he died in 1975 at the age of 92. The company hired a mountain climber who helped workmen reach the site to prepare a helicopter landing place. Investigation of the claims was then easier. The prospect proved not to hold the mineral riches that Radovan and the company had hoped. Title to the claims was donated to the National Park Service in 1985. The 250-acre donation included 18 mining claims, six millsites, and a number of buildings. 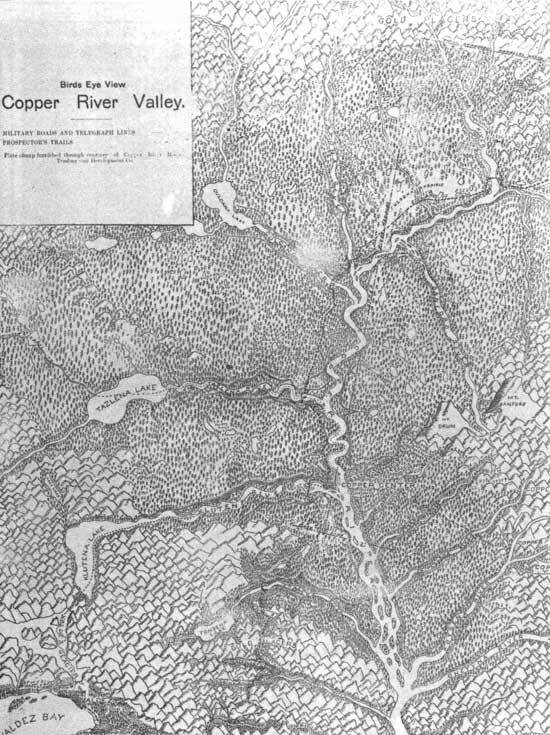 Philip Smith of the USGS was right in his 1933 speculation that no other rich copper lodes would be found in Alaska. Efforts were made from 1900 to the 1930s, but no other "marvelous lodes" were discovered. It is part of the Kennecott legend that the syndicate refused to develop all the copper available in the region because of a greater commitment to copper properties owned outside Alaska. As recently as 1964, Charles G. Hubbard, then in his 90s, a historian that Stephen Birch, the longtime head of Kennecott, was ruthless and unscrupulous and refused to develop claims Hubbard offered for sale. But the record of the Hubbard-Elliott holdings suggests that both Hubbard and his partner, Henry Elliott, did well with their copper claims. The prospectors had entered the Copper River country in 1897 but did not discover their significant copper prospects until 1901. They located on Elliott creek, a Kolsina tributary and, finding other prospects in 1902-1904, prepared to reap a fortune. The fortunate partners alleged that "experts" had confirmed their high estimation of Elliott Creek ores, but the first "experts" were followed by others over the years. One such, an engineer who wrote anonymously, was sent in 1904 from Cedar Rapids, Iowa, to Seattle and Valdez from whence more difficult travel commenced. From Valdez, the engineer traveled with a packhorse outfit, leaving town on July 27, following "the new railroad right of way," then the government trail through the "Lowe River Canyon" (Keystone Canyon), on a trail "narrowed down to only a few inches along the side of the mountain . . . on our left was a wall hundreds of feet, on our right, sheer precipices hundreds of feet." A magnificent waterfall 600 feet high awed him as the party moved on, reaching Camp Wortman in the evening. Out of Wortman's, the rough trail was dangerous with mud and snowdrift. One horse slid down 200 feet on its side. At Beaver Dam Roadhouse, "run by two old maids from Boston," the travelers refreshed themselves, then pushed on to Earnestine on the 30th and Tonsina on the 31st. They made 25 miles the next day to reach the Copper River, crossing on Doc Bellum's ferry. The history of the Elliott Creek claims is richer in incident than other copper prospects in the region, but the bottom line was the same. It was far easier to announce "another jumbo" than to find one. The Ballinger-Pinchot dispute loomed large as an issue affecting mining in the early years of the century. It was in essence a controversy over resource development and occasioned the nation's first, widespread public debate over conservation. In 1904, Congress permitted entry to Alaska coal lands under private survey (because public surveys were lacking) but restricted individual holdings to 160 acres. When Clarence Cunningham made a number of locations, there were allegations that the Morgan-Guggenheim syndicate was involved in a scheme to control all the territory's coal. President Theodore Roosevelt responded by withdrawing all coal lands from entry by executive order. Gifford Pinchot, chief of the U.S. Forest Service, pitted himself against Secretary of the Interior Richard Ballinger on the conservation issue. Ballinger, appointed secretary by President William H. Taft in 1909, had been commissioner of the General Land Office when an interior department investigator exposed an apparent Cunningham-syndicate relationship. Commissioner Ballinger ignored the allegations pressed in 1909-1910 by Pinchot, an ardent conservationist. Taft fired Pinchot for suggesting that he was in cahoots with Ballinger in the syndicate's plot to control public lands. Eventually, Congress investigated the affair and exonerated Ballinger. Pinchot did not give up the battle. Roosevelt took up his cause as a campaign issue when he ran as a third-party candidate in 1912 against Taft and Woodrow Wilson. Andrews' views, expressed in 1910, were echoed decades later by Archie W. Shiels, who had been a storekeeper for Michael Heney during railroad construction. He quoted a speech made by Simon Guggenheim in 1910, directed against conservationists who argued that Alaska's riches belonged to the people. Guggenheim noted that the wealth was useless until found and developed: "men and capital must do the work, and it is risky for both. Both . . . are entitled to rewards commensurate with the risk, and if Alaska is to be developed at all, the interests of those two classes must be guarded as jealously as the interest of those who sit in comfort at home." What miners and other Alaskans believed was not so easily summarized as Storm indicated. If numbers of them had not believed some of Wickersham's charges, it is unlikely that he would have won the biannual delegate elections from 1908-1914 when the controversy raged furiously. The death of Dan Guggenheim in the Titanic disaster of 1912 had a great impact on the corporation's role in Alaska. Expansionist policies were curtailed, although the retrenchment did not change the prevailing unfavorable image of the "Guggs" among Alaskans. The syndicate might have fared better in public regard but for its obvious determination to dominate Alaska politics. Copper River and Northwestern Railway workers, many of whom were not eligible to vote, were encouraged to vote against Wickersham at Cordova in the 1908 election for congressional delegate. This upset Wickersham who had already been annoyed by the syndicate's publication of earlier correspondence showing his interest in being retained as company counsel by the Guggs. Another exposure of letters by company officers revealed that Wickersham had not favored home rule for Alaska earlier, although he had made demands for a territorial legislature and other home-rule measures the thrust of his campaign. It was the chicanery involved in a coal contract that eventually resulted in the prosecution of some syndicate officers. H.J. Douglas reported that the syndicate's David Jarvis had agreed with officers of another company on the price for coal to be offered for shipment to Forts Davis and Liscum in Alaska. Further investigation and much urging from Wickersham led to a federal prosecution of company officers at Tacoma, Washington. The involvement of David Jarvis in corrupt practices of the syndicate was painful to many of his friends in Alaska and elsewhere. Jarvis had been admired by President Theodore Roosevelt, who considered him the embodiment of manly virtuescourage, decisiveness, intelligence, and integrity. Jarvis established himself as a national hero in 1898 when, as an officer in the U.S. Revenue Marine, he directed an overland reindeer expedition in relief of whalers caught in the arctic ice. Later, as Alaska's collector of customs, Jarvis enhanced his reputation. Roosevelt offered his favorite Alaskan the position of territorial governor in 1906 and, when Jarvis declined, accepted his recommendation of Wilford B. Hoggatt. Jarvis chose a more lucrative job as a director for the Alaska syndicate. This story made Harrais "gasp for a moment," but she believed it. Morgan did not fulfill his promise but, she believed, it was because the conservationists led by Gilbert Pinchot excoriated everyone who wished to develop Alaska and their nastiness dissuaded Morgan. Yet Morgan did make it possible for Birch to develop the copper mines, "give employment to thousands of men at good wages, give the prospector a chance to earn a grubstake and keep him in Alaska, and enriched the world by over $200,000,000 in new wealth." 1. Copper River Mining Co. v. McClellan, 2 Alaska Reports, 134. The case was appealed to the U.S. Supreme Court. Published depositions of all parties involved including Major W.R. Abercrombie are part of the file for case #20006 which is in the National Archives. 2. William C. Douglass, "A History of the Kennecott Mines," typescript, NPS files, 4. 3. E.J.E. Schuster, "The Reynolds System," (Anchorage Daily News, "Alaska Living," July 30, 1967, 7-9), passim. 4. Hazelet to Hasey, September 2, 1907, Keystone Canyon Collection, microfilm 140, UAF. 5. Perry to Lathrop, September 16, 1907; Lathrop to Perry, September 19, 1907, Keystone Canyon Collection, microfilm 140, UAF. 6. McAdams to Chief Wilkie, March 18, 1908, Keystone Canyon Collection, microfilm 140, UAF. 7. Hoggatt to Secretary of Interior, October 26, 1907, Keystone Canyon Collection, microfilm 140, UAF. Wickersham diary, March 27, March 28, April 1, 1908, AHL. Wickersham attributed Harlan's behavior to grief caused by his son's death. 8. Roosevelt to attorney general, December 27, 1907, February 10, 1908, Bonaparte Papers, Library of Congress. 9. McAdams to Chief Wilkie, March 20, 1908, Keystone Canyon Collection, microfilm 140, UAF. 10. Ostrander to Tom Donohoe, March 28, 1908, Donohoe-Ostrander Collection, UAF. 11. Ostrander to Tom Donohoe, April 12, 1908, Ostrander-Donohoe Collection, UAF; the district court record is U.S. v. Hasey, case 545B, RG21, FRC. 12. Woodrow Johansen, "The Copper River and Northwestern Railroad," Northern Engineer, Vol. 7, No. 2, Summer 1975), 19-31. 13. Carlyle Ellis, "The Winter's Crucial Battle on Copper River," (Alaska-Yukon Magazine, June 1910), 27-35; Sidney D. Charles, "The Conquering of the Copper," (Alaska-Yukon Magazine, December, 1910), 365-70; Hawkins' report. Copy in NPS files. 14. Woodrow Johansen, "The Copper River & Northwestern Railroad," (Northern Engineer, Vol. 7, No. 2, Summer 1975), 25. 15. John Kinney, "Copper and the Settlement of South-Central Alaska," (Journal of the West, May Vol. 10, No. 2, April 1971), 311. 16. May Grinnell, "Cordova," (Alaska-Yukon Magazine, August 1909), 327. 17. W.K. Keller to Julia Seltenrich, December 15, 1931, McKay collection, UAF. 18. The 49th Star, September 21, 1946. 19. W.E. Dunkle, "Economic Geology and History of the Copper River District," (paper at Alaska Engineers Meeting, Juneau, 1954), 3-5. Mackay Collection, UAF. 20. Douglass, "A History of the Kennecott Mines," 6-7. 21. Alfred H. Brooks, Mineral Resources of Alaska: Report on Progress of Investigation in 1919, USGS Bulletin No. 714 (Washington, D.C.: GPO, 1921), 194-96. 22. John Kinney, "Copper and the Settlement of South-Central Alaska," (Journal of the West, Vol. 10, No 2, April 1971), 315. 23. Melody Grauman Webb, "Big Business in Alaska: The Kennecott Mines, 1898-1938," (Fairbanks: Cooperative Parks Studies Unit, 1977), 37. 24. Robert L. Spude and Sandra M. Faulkner, "Kennecott, Alaska," (Anchorage: NPS, 1987), 7. 25. Grauman Webb, "Big Business in Alaska," 38. 26. "General Points of Interest on the Kennecott Mother Lode Mines," July 15, 1924. Kennecott Collection, UAF. 27. Contract of June 7, 1923. McCracken Collection, UAF. 28. Douglass, "School Days," Douglass Collection, UAF. 29. McKay memoirs, McKay Collection, UAF. 30. Grauman, "Big Business in Alaska," 45-46. 32. Ernest VandeVord v. Kennecott court record, case C-39, RG 21, FRC. 33. Daniel S. Reeder v. Katalla Co. and Copper River & Northwestern Railway, court record, case C-42, RG 21, FRC. 34. James Heney v. Copper River & Northwestern Railway, case record, case C-49, RG 21, FRC. 35. Estate of E.A. Reed v. Copper River & Northwestern Railway, court record, case C-50, RG 21, FRC. 36. Matilda A. Snyder v. Edward Kelter and George C. Hazelet, court record, case C-38, RG 21, FRC. 37. J.E. Dyer v. Copper River & Northwestern Railway, court record, case C-3, RG 21, FRC. 38. Philip S. Smith, Mineral Resources of Alaska Report on Progress of Investigation in 1933. USGS Bulletin No. 864, (Washington, D.C.: GPO, 1936), 59. 39. Twenty-Fourth Annual Report of the Kennecott Copper Corporation, 1938, 6, Kennecott Collection, UAF. 40. Douglass, History of the Kennecott Mines, 11; Webb, "Kennecott," 207. 41. Moffit and Mertie, Jr., The Kotsina-Kuskulana District, Bulletin No. 745 (Washington: GPO, 1923), 115. 42. Department of Interior news release, NPS, July 30, 1985; publications of the Geneva Pacific Corp., NPS files; Theodore W. VanZelst to Robert Spude, November 27, 1984, NPS files. 43. Chicago Record - Herald, January 19, 1902. 44. Diary of unknown visitor, Kennecott collection, NPS files. 45. Alaska Monthly Magazine, July 1907, p. 9. 46. Elliott v. Elliott, 3 Alaska Reports, 352-76; Hubbard v. Hubbard, court record, case 669, RG 21, FRC. 47. Wickersham to President Warren Harding, January 6, 1921, NA, RG 60, Letters Received. 48. See Melody Webb Grauman, Kennecott: Alaska Origins of a Copper Empire, 1900-1938," (Western Historical Quarterly v. 9 No. 2 April 1978), 197-211; Robert A. Stearns, "The Morgan-Guggenheim Syndicate and the Development of Alaska, 1906-1915," (Ph.D. dissertation, Santa Barbara: University of California, 1967), passim; Nichols, Alaska, passim; Hunt, Alaska, 135-66; U.S. Senate, Investigation of the Department of the Interior and of the Bureau of Forestry (Washington: GPO, 1911), passim. 49. Andrews, "Viewing the Copper River Spectacle," (Alaska-Yukon Magazine, October 1910), 237. 50. Sheils, The Kennecott Story, Typescript, AHL, 8. 51. Storm, "Chitina Copper Region in Southern Alaska," (Engineering & Mining Journal, November 19, 1910), 1011. 52. Wickersham diary, April 30, 1910, UAF. 53. Carson to Jarvis, May 6, 1908, Keystone Canyon Collection, microfilm 140, UAF. 54. John Boyce, Appointments file, NA, RG 60. 55. McNamara to attorney general, February 11, 1911, Keystone Canyon Collection, microfilm 140, UAF; Elmer Todd to attorney general, April 14, 1911, Keystone Canyon Collection, microfilm 140, UAF. 56. Janson, Copper Spike, 64; Wickersham diary, June 24, 1911, with clipping of New York Times story of the same date, UAF. 57. Harrais, "Alaska History Manuscript," chap. 28, 3, Harrais collection, UAF. 58. Ibid., 7, Harrais collection, UAF. Harrais collection. 59. Nichols, Alaska Stearns, "Alaska's Kennecott Copper," (Alaska Journal 1975), 130-139; Stearns, Morgan-Guggenheim Syndicate and the Development of Alaska. 60. Webb, "Kennecott: Alaskan Origins of a Copper Empire, 1900-1938," 210.